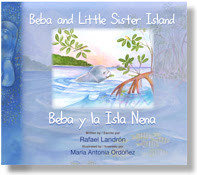 New York, Nov. 4, 2010 - Campanita Books announces the release of its latest bilingual children's book, BEBA AND LITTLE SISTER ISLAND. Featuring Beba the manatee and her many friends. A fable inspired by the true story of how the people of Puerto Rico saved "Sister Island" Vieques from environmental destruction. This wonderful story, penned by talented new writer Rafael Landrón and gorgeously illustrated by award winning artist María Antonia Ordóñez, is a timeless tale of courage, solidarity, love and justice set in the beautiful waters of the Caribbean. Beba, a young manatee, is summoned by her friends to travel and discover the origin of the thunderous noise they keep hearing coming from a nearby beach. She swims to the site, and discovers gigantic ships destroying their little island! What can a manatee and a group of animals do to stop the destruction? Plenty! As you will see when you read BEBA AND LITTLE SISTER ISLAND. The adventure of Beba was inspired by the true story of the people of Puerto Rico who through coordinated efforts and non-violent actions, forced the Unites States Navy to leave the island of Vieques after 60 years of bombings, target practice, and military maneuvers. In BEBA AND LITTLE SISTER ISLAND, the animals play the role of the real-life heroes whose courageous acts tipped the scale and literally saved the island. Most of Vieques (affectionately called la Isla Nena – translated in the book as Little Sister Island) had been turned into a radioactive, polluted, devastated landscape. With the departure of the Armed Forces the island is on its way to recovery, but it will be decades before the damage is reversed. "The story never makes direct reference to where the big ships come from, or what they are doing there", explains author Rafael Landrón. "I wanted the message to be universal". Editor Mario Picayo worked with illustrator María Antonia Ordóñez to ensure that the visual depiction of the environment was accurate. Ordóñez's meticulous research, and attention to detail paid off as her stunning watercolors enrich the story. "We decided to give the book that extra dimension. Readers can learn about the flora and fauna of Vieques, and by extension of Puerto Rico and the Caribbean. Every bird, every fish, and every plant in the book can be found in nature", Picayo explained. One exception to that accuracy according to Landrón, is found on page 28. " You can spot a chupacabras! It's a little visual joke they played on me, and on all readers. The chupacabras was first reported in Puerto Rico, therefore its presence is a wink, acknowledging the Puerto Rican roots of my story." Rafael Landron is an emerging poet, performer, and writer. His works include THE BRUISED MANGO, a collection of poems, and RAFI'S ANTIWAR EXPRESSIONS, a Nuyorican response to the Iraq war. BEBA AND LITTLE SISTER ISLAND is his first children’s book. Rafael is an adult educator at Boricua College, where he finds inspiration and believes that creativity and imagination will end militarism and bring peace. DO LEAVE A COMMENT. Let us know if you have read this book. Let us know if you remember the whole Vieques controversy and if you have been back to Puerto Rico lately. Happy Reading.